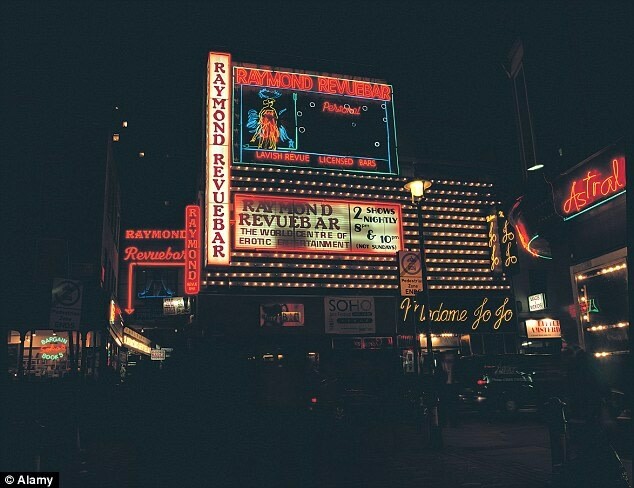 I lived and worked in Soho for many years, so I knew all about the famous nightclub ‘Raymond’s Revue Bar’. It wasn’t unusual for Paul Raymond, the self-made billionaire, to walk past you wearing his full length fur coat draped over his Saville Row suit. More interestingly for me was the neon sign advertising the club which covered two stories of a three story building. This was a big, complicated sign boasting animated neon figures, champagne glasses, stars and lettering - the works! At the height of its success, this club entertained film stars, gangsters, politicians, even royalty. Over the years I had photographed the sign many times, in different light, night and day, but never seemed to get the image that I wanted to work from. But five years ago Raymond, now deceased, the club and more so the industry he made so popular, was in decline. 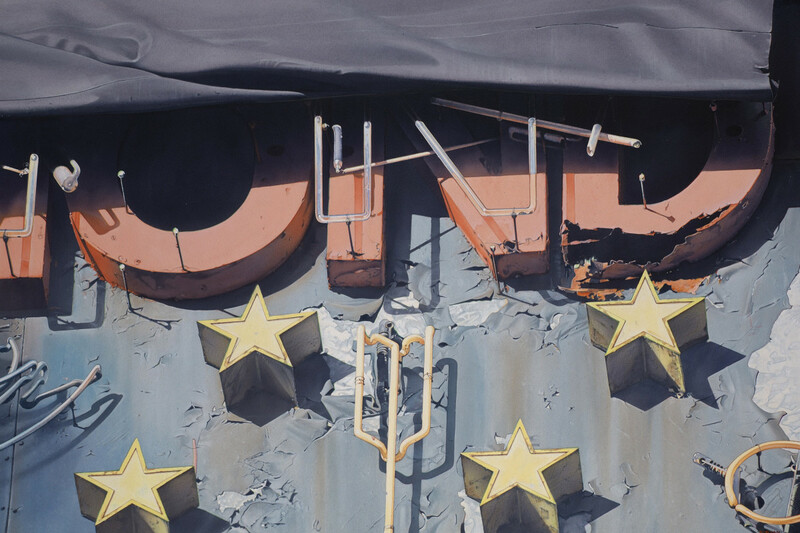 The sign was now in an advanced state of decay and a piece of roofing material had blown over the edge of the building covering half of the lettering and this was exactly the image I was after. It gave the whole picture a sense of mystery, the broken decaying sign a metaphor of that now outmoded industry. I am always looking for ways to add or subtract things from my reference photographs in an effort to create more visual impact. In this painting I added more stars as I felt they gave more balance to the composition. My father was a scenic artist and set designer working for the famous Elms Leicester Studios in Flitcroft Street, Soho and in his time worked on many projects for Paul Raymond involving backcloths and set designs for the club. If my dad were alive today he would be very interested to see the changes as you walk through the Soho that Paul Raymond helped create.